I actually had a 3DS back in 2011. I admit it – I bought it because it was novel at that time. 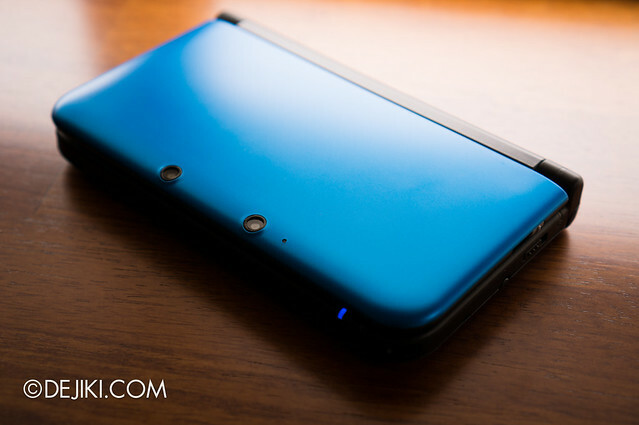 The 3DS has an auto-stereoscopic (3D without glasses) screen, improved graphics and CPU, a slide pad – things that the previous Nintendo DSi series lacked. There weren’t many games, so I only had Ridge Racer 3D and Tetris Axis. I also can’t believe that I paid $399 right when it launched in Singapore. After a few months, it spend most of its days on the charging cradle. I sold it off when I bought the Playstation Vita. Fast forward two years and I found myself back with a 3DS again. This time, the 3DS XL. 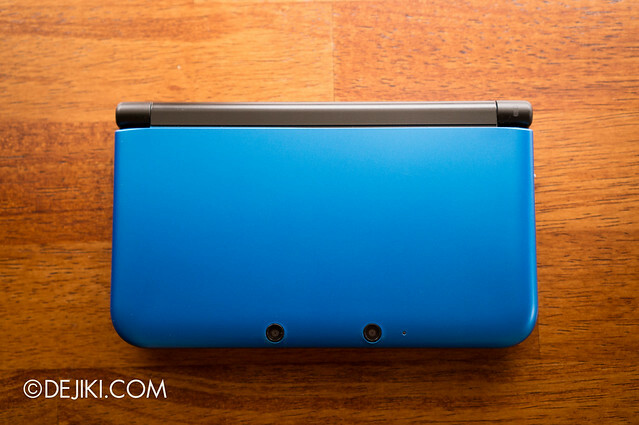 The 3DS XL is a redesign of the original 3DS. This is Nintendo’s current generation of portable game consoles, with both models available for sale at most stores. Having larger screens and more rounded edges makes gameplay more immersive and comfortable. It also ditches the glossy and busy “colour stacking” design of the original 3DS, going for a matte and more refined feel this time. Even though it has been two years since I last held the first 3DS, I could instantly appreciate the details of the redesign, and enjoy the 90% larger screens. The top screen measures 4.88″ (124 mm) and the bottom one 4.18″ (106 mm) – as large as leading Android smartphones, and bigger than the screen of the iPhone 5. The larger pixels make some of the 3D edges look more jagged (as the resolution of the screens did not increase), but over time it became a non-issue. Text still appears crisp. The 3D effect is slightly better, but still not perfect. 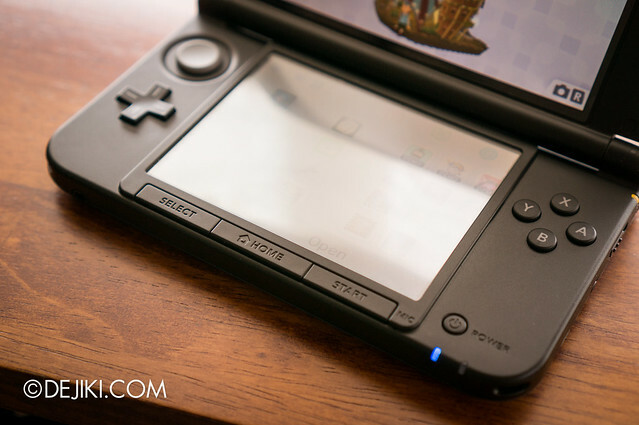 The 3DS XL’s row of three buttons, below the touch screen, are more durable and easy to press than the ones on the 3DS. The only reason I bought the 3DS again? The games. I’m enticed by Luigi’s Mansion, Professor Layton and the Miracle Mask, Resident Evil Revelations (yes, a Resident Evil game?? on a handheld?? ), Animal Crossing, Monster Hunter 3 Ultimate (again, on a handheld??) and the upcoming Pokemon X and Y. Over the past two years, Nintendo has built an extensive and strong library of first party and third party titles. We now have a few Mario games, JRPGs from Atlus, Fire Emblem Awakening, Monster Hunter 3 Ultimate, Luigi’s Mansion, Kid Icarus Uprising and Animal Crossing: New Leaf. In the pipeline are favourites such as Mario & Luigi, Pokemon X and Y, Ace Attorney: Dual Destinies and a brand new Legend of Zelda title. These games are not (entirely) new IP, but already made famous from previous titles. Nintendo’s strategy of building on existing games (or more like, releasing improved versions of a similar game) for a large fanbase has very worked well for a long, long time. This has also spurred third party studios to do the same. The eShop also has a wider range of games, including classics from Gameboy, Gameboy Color and Gameboy Advance. Seeing these old games available were quite a delight, but the prices were definitely not music to my ears. I hope Nintendo sees some sense eventually and drop the prices – with great iOS and Android games available below US$4.99, paying US$5.99 for an immaculate digital copy of The Legend of Zelda: Oracle of Seasons (Gameboy Color, 2011) is simply a rip-off. The eShop provides a selection of 3DS games that could be downloaded onto the SD card, allowing multiple games to be kept in the console without switching. However, unlike Sony (for PlayStation Vita), Nintendo has kept the prices the same as physical game cards. Their argument is that despite the lack of logistics and printing costs, the ability to keep multiple games is a privilege that is worth paying extra. Sony offers PlayStation Vita download games at a small discount. Apart from not offering players with a discount, Digital Download games only the 3DS have another major drawback. Players do not actually “own” the downloaded games. In some ways, the consoles are actual owners of the games. There is no way to redownload a game (except to the same 3DS console) so if someone loses their 3DS, they lose all downloaded games. Same thing for broken or malfunctioning consoles that are out of warranty. The only exception is when a user is changing to a new 3DS – they can transfer games (like cut and paste) using a built-in app to the new 3DS. This is a one-way transfer – games would then be deleted on the old 3DS. For PlayStation Vita, games can be re-downloaded for free to another device (say a user bought a replacement or a new PSVita in another colour) by using PSN login. As long as only one device is used to play the games, there wouldn’t be any problems. That is unfortunately, the price to pay to be a customer of Nintendo. I have no idea why they have yet to adopt a proper account system, which is commonplace on content delivery platforms built by Sony, Microsoft, Apple and Android for several years now. The 3DS has some innovative social features, such as StreetPass, allowing the exchange of game data (could be anything from in-game items, race records, high scores, characters etc) wirelessly and automatically when two consoles are near each other. This encourages all users to bring the 3DS along whenever they leave their homes. However, the “friends list” feature, like all past and current Nintendo consoles – is still a major hassle. Adding friends is not as simple as sending and accepting requests. Both users have to add each other by inputting 12-digit friend codes. This becomes tedious when you have a list of friends to add. Just like downloaded games, friends lists are tagged to the console – so a long and tedious task awaits users who are switching to another console without access to an existing 3DS. There is also no system-wide chat or mail system, in text or voice. These are features that the PS Vita excelled in from day one. 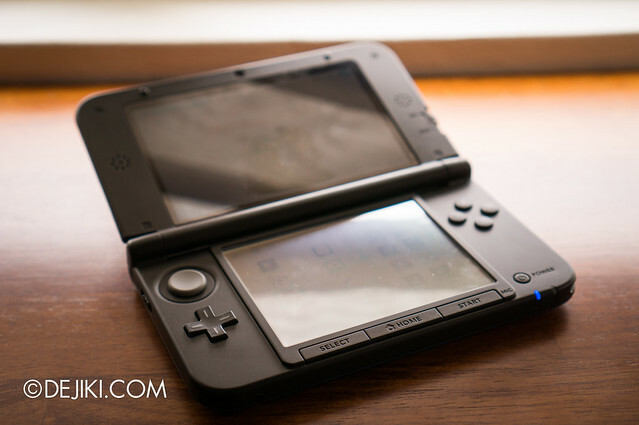 Even after two years, the 3DS system user interface still feels sluggish and incompetent – essentially not up to par to Sony. The 3DS XL has a street price of less than S$300 in Singapore, which given its larger and more effective screens, a bargain compared to the first 3DS. Sony’s PlayStation Vita, although still leaps forward in terms of features and visually-impressive games, is struggling to keep up with their strong start. Despite having games that are expensive (compared to smartphone games) and looks “dated”, Nintendo still excels in addictive gameplay and improved sequels to their bestsellers – though somewhat repetitive. However, users who are not accustomed to their signature games, or don’t want to carry around another gadget, would find the 3DS XL (or the 3DS) less attractive. Consoles sold in Singapore are mostly “US” sets, though there are two variants available: The “official Singapore” sets which are covered with a year of local warranty, and “US” sets that are imported by game shops. Warranty policy for imported sets varies, so do check with the store before purchase. Both types play locally available games as well as games imported from the US (say from Play-Asia or Amazon). The US eShop is also accessible in Singapore if you have region settings configured to the US region. But do note: to use credit cards issued in Singapore, you have to set your Country as Canada. Alternatively, pre-paid store cards can be purchased from local game stores and redeemed on the eShop without linking a credit card to your 3DS. To save money, choose a state with low (or no) sales tax in the 3DS eShop’s region settings, as all purchases on the eShop are subject to sales tax. If you’re playing Animal Crossing: New Leaf, my friend code is 4570-7442-0304. Do leave a comment with your friend code so I can add you back! Wow. I just bought an XL in June! It is the Animal Crossing edition. I like the pattern! Added you! My FC is 0877-0947-7573 and I’m on Animal Crossing!